Toxoplasmosis is an infective disease caused by parasite Toxoplasma gondii. The infection is mainly transmitted from cats to humans. Feces and urine of cats is infected with this parasite and if the food is exposed to these substances and then eaten raw without being washed properly one may catch the infection. Most people are not even aware of the fact that they are suffering from toxoplasmosis as they tend not to present any symptom of the disease. These cases are classified as asymptomatic. They can account for almost 80% of all cases. This happens as the immune system of majority of people functions properly hence the body becomes immune to the parasite and continues living with it for a long time. On the other hand there are cases with evident symptoms of the disease. Lymph nodes (of the neck or groins) may become enlarged. Additionally flu-like symptoms occur on the whole body aches and pain is located mainly in muscles. Increased body temperature and fatigue may be present as well. One can complain about sore throat and difficulties with swallowing. In general patients who are presenting the obvious signs are feeling extremely sick. Certain groups of people can develop severe complications due to toxoplasmosis. 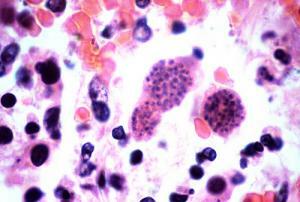 If pregnant woman gets infected with Toxoplasma gondii the infection will leave permanent damage onto her fetus. The baby may develop congenital toxoplasmosis. If infection happens in early stages of the pregnancy the consequences include possible miscarriage and stillbirth. What is odd is that a woman does not even have to present any sign of the disease. This is why women are routinely tested on toxoplasmosis when they become pregnant. In case baby develops congenital toxoplasmosis the symptoms and signs of the disease might include one of the following: hydrocephalus (also known as water on the brain), severe brain damage and seizures. A child can be born deaf or blind. Jaundice is another common symptom of congenital toxoplasmosis. Both liver and spleen may be enlarged. There is obvious problem in growth. What is more is higher chance that baby will suffer from cerebral palsy. In case that mother becomes infected at the very ending of the pregnancy (third trimester) the baby may not present any symptom of the disease at birth. Still there will be consequences which will become visible later. These include infections of eyes, loss of hearing and problems with learning. Toxoplasmosis may be lethal for immunocompromised people. The reason is that their immune system cannot fight the infections. The risk groups include people suffering from AIDS/HIV, cancer, those who are subjected to chemotherapy and those who are on immunosupresants because of the previous organ transplantation. In these patients the risk of irreversible damage onto the brain and eyes is highly increased.